Gem5.com is a new website that we’ve wanted to review a bit. 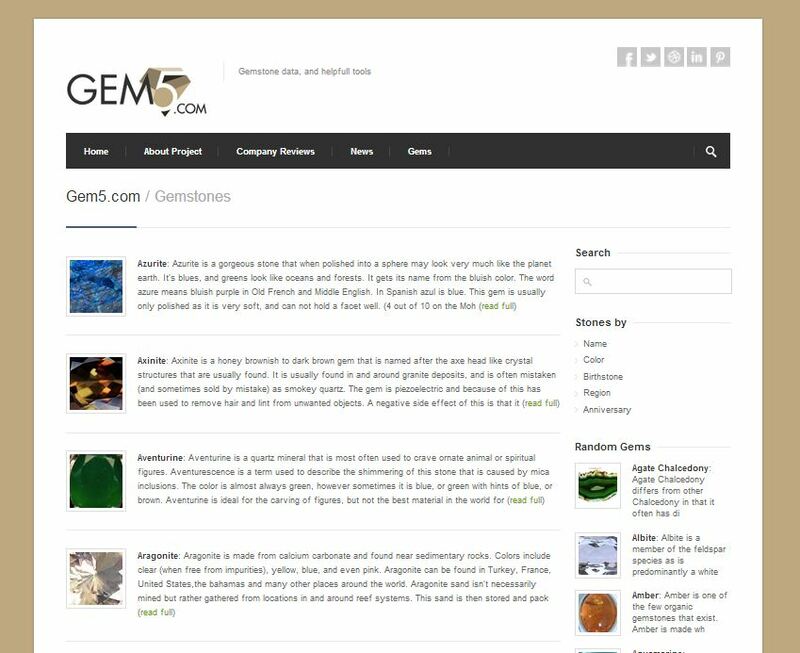 Gem5.com seems to be set up to inform persons looking for gemstone data. It’s sorta like a gemstone encyclopedia if you will. It has easily accessable search boxes on the top right and middle right of every page. The site also appears to be “responsive” in that it changes resolution to match the device that you are viewing it on. In other words it looks different on a mobile phone than on a 21″ lcd monitor. All in all nice photos, and very unique descriptions have been added. Photos come in 2 sizes..1 the original and 2 a smaller thumbnail size photo that displays as what we might call an icon. The descriptions provide both accurate historical data and common industrial usages if known. The main description body speaks on where to find the gem, the gem value, the color of the gem, the rarity, and how it is usually prepared. The site also offers company reviews so you can check real user feedback on stores both on and offline. This site is a keeper and we’ll be checking back with it soon to see what improvements and adjustments they have made to the site.